It might seem like a year of Yahoos, but the current monthly series of chess in the mainstream press, last seen in July Yahoos, started with October Yahoos (October 2017). That makes this month's August Yahoos the 11th straight month of Yahoos. The United Kingdom has decided to allow a 9-year-old chess prodigy to remain in the country, after his father's work visa expired and his family faced deportation back to India. Shreyas Royal is "very delighted" with the news, his father tells NPR by email. Shreyas has lived in the U.K. since he was 3 and has played chess since he was 5. Now, within his age bracket, he is the top chess player in England and one of the top 10 globally. For the BBC version of the same story, see Shreyas Royal: Child chess prodigy's family can stay in UK (bbc.com). 2018-08-17: Kevin Love on LeBron James: ‘He’s playing chess and everyone else is playing checkers’ (yahoo.com). This second Yahoo is hardly worth mentioning -- the only mention of chess (or of checkers) is the headline -- but it gives me the opportunity to point to another old post, A:'Playing Checkers' vs. B:'Playing Chess' (October 2014). For many observers, the main interest in TCEC's lower divisions was the participation of the two NNs, Leela and DeusX. Once both engines were eliminated, interest shifted to which engine will finish first for the season. My name is Tryfon Gavriel, I run www.chessworld.net. FIDE Candidate Master, British Regional Master. Reached peak ECF rating of 212 (equivalent to about 2350 USCF) in July 2014, and 216 rapid (within rank top 50). He has also been one of Leela's biggest supporters since the engine first appeared on the scene. Of his many Leela videos, this one has the highest view count. For Kingscrusher's source of inspiration on recent Leela games, see a post in the Leela forum, More Leela games needed (for commenting). We've already seen a video from ChessBase India (January 2018) in our long-running series on The Sociology of Chess (November 2016). For the previous post in the series, Fiske's 'Chess in Iceland' (July 2018), I featured a book ('The island of Iceland is an anomaly and a marvel') and in this post I'll feature another video, again from ChessBase India. The national visually challenged team is present in Sofia, Bulgaria for the World Team Championship 2018. We ask the players Kishan Gangolli, Soundarya Kumar Pradhan, Ashvin Makwana, Aryan Joshi and Subhendu Patra about what chess means to them. We also have Charudatta Jadhav in the video, the IBCA and AICFB president who has played a key role to spread blind chess in the country. FIDE is the apex body for chess amongst the sighted. Similarly the International Braille Chess Association (IBCA) is the apex body of chess for the blind and visually impaired and is in turn affiliated to FIDE. The main purpose of IBCA is to promote chess for the blind and visually impaired across the globe. In nearly every post about the 'The Sociology of Chess', ChessBase India has at one candidate on the video short list, usually several candidates. I'm sure we'll see one of them again. (A) Investigate why the security certificate (issued by Let's Encrypt 'Free SSL/TLS Certificates') is only valid for three months, to 15 October 2018. (B) Examine the impact on the site's stat logs. (C) Flag the HTTPS change to Google search. The objective of Let’s Encrypt and the ACME protocol is to make it possible to set up an HTTPS server and have it automatically obtain a browser-trusted certificate, without any human intervention. This is accomplished by running a certificate management agent on the web server. [...] There are two steps to this process. First, the agent proves to the CA that the web server controls a domain. Then, the agent can request, renew, and revoke certificates for that domain. The key word there is 'renew'. I'll come back to the subject in mid-October, and I hope it won't require a blog post. (B) Stats: The first thing I noticed was the size of the daily logs, which started getting larger the day I activated HTTPS across the site. Is this related or just a coincidence? When I examined the log file for that day I saw some files logged twice -- once with a 301 redirect code and a small file size followed by a 200 code and a large file size -- indicating that a redirect had occurred. My own activity ('Testing HTTPS') was traceable, which gave me an anchor point. The stat summaries showed a huge number of 301 redirects, which were negligible in previous months. Will this decline over time, as external requests include the HTTPS, or will it be constant? Since the files are aggregated by month, it will take a few months to see the effect. (C) Google search: I was happy to see that Google search results include the HTTPS, outlined in red in the following image. I'll continue to look at other Q+2P:Q+P endgames and will post anything unusual that I find. I'll also look at other endgame sources to investigate the accuracy of their analysis. The next section in Averbakh's book covers Q+2P:Q+P where the strong side has a passed Pawn. I fed all six examples to the Lichess tablebase and discovered that Averbakh's analysis was correct on five of them. The exception was a study by F.Prokop, shown in the top diagram, Black to move. The study continued 1...Qb2+ 2.Kc5! (a temporary Queen sacrifice) 2...Qe5+(*) 3.Kc4 Qf4+(*) 4.Kd3 Qd6+(*) 5.Kxe3, arriving at the bottom diagram. Here the Averbakh/Prokop analysis continued with three candidate moves, all of which lead to a win for White. The most interesting for me is 5...Qg3+ 6.Qf3 Qg1+ 7.Kf4 Qh2+ 8.Kg4 Qg1+ 9.Kh3 Qxg7 10.Qa8+ Kf7 11.Qb7+ Kf6 12.Qxg7+ Kxg7 13.Kg4, because it shows a common theme in Q+P:Q endgames. The strong side trades Queens to arrive in a position with K+P:K, where the Kings are far apart and distant opposition plays a leading role. A similar idea is behind 2.Kc5!. In the bottom diagram, the tablebase indicates a fourth move, 5...Qh6+, which it says is the only move leading to a draw. It appears that Black has a perpetual check with this move. The variations branch off into so many sub-variations, that it is impossible to follow all of the key moves. I'll just have to trust the tablebase on this. In the main variation starting 1...Qb2+, what do the asterisks '(*)' mean? They identify moves that the tablebase indicates are the only move leading to a draw; other moves lose. The tablebase also says that there is an alternate solution in the diagrammed position: 1...Qe6+ also draws. In a footnote, Averbakh indicated that the top diagram was in fact an intermediate position in Prokop's study, because the previous moves were flawed. With so many branching variations in Queen endgames, it's not surprising that both the original analysis and the subsequent correction were flawed. Congratulations to Bojun Guo (aka noobpwnftw) and Ronald de Man (aka syzygy) for completing the first free 7-piece tablebase and generously sharing it with the world! Lichess now provides online access on the analysis board and in studies, practice against tablebases, a public API, and a mirror for downloading the full tablebase files. For the accompanying discussion, see General Chess Discussion / 7-piece Syzygy tablebases, with more links to other resources. Six-piece tablebases are useful but somewhat limited. When we exclude the two Kings that are present in every position, we are left with four pieces, which are not sufficient for evaluating many positions where the stronger side has the advantage of a Pawn. Six-piece tablebases are most interesting for positions with unbalanced material, like R+P:B+P. With seven-piece tablebases, we suddenly have a tool for examining positions like R+2P:R+P, which are notoriously difficult to analyze. Lately I've been interested in Queen endgames, because their outcomes -- win or draw? -- are difficult to predict during a game. Their analysis often goes beyond the horizons of current engine technology. Here's a simpler, well-known 19th century position from Averbakh's book on Queen endgames. It shows the Lichess interface. The key move is 1.Qa2+. The Queen climbs a ladder on the a1-h8 & a2-g8 diagonals to force a won K+P endgame. For more about Averbakh, see Averbakh's R+P vs. B+P Endgames (September 2017). I'll continue to look at other Q+2P:Q+P endgames and will post anything unusual that I find. I'll also look at other endgame sources to investigate the accuracy of their analysis. In the meantime, I'd like to give a big thanks to Stefan Meyer-Kahlen for the resource that I've been using for the last ten years or so: All 6 men chess endgame databases available online (shredderchess.com). Both Leela and DeusX qualified from TCEC S13 division four to division three, another quadruple round robin with eight engines competing. As I write this, that event has reached the second stage. The engine Ethereal has a large lead over six engines (including the two NNs) which are bunched together, vying for the second qualifying place into division two. Ethereal, the chess engine by Andrew Grant, is the winner of TCEC Div 3. After three months of rapid development, Ethereal came stronger than ever and outwitted the competition in the division finishing 22,5/28 -- full 6,5 points ahead of competition. Tiebreaks  If necessary, tiebreaks can be used to determine advancement. For all Divisions (not the Superfinal), the first tiebreak criteria is the "crash" tiebreak, meaning that if an engine has crashed once or more during the Division, it will fail qualification versus another engine that has not crashed if both of them has the same amount of points. In case of still being tied, then the direct encounter between the tied engines decides. The next criterion is the greatest number of wins, then the greatest number of wins with black. The Sonneborn-Berger is the next criteria. If they are still tied, then the tournament organizers will decide which engine gets the promotion. I gather from this explanation that the '"crash" tiebreak' played no role. Since the minimatch between the two engines ('direct encounter') was +1-0=3 in Arasan's favor, it qualified into division two. Some Leela supporters hoped that both engines might go through, but what good are rules if they're not enforced? For many observers, the main interest in TCEC's lower divisions was the participation of the two NNs, Leela and DeusX. Once both engines were eliminated, interest shifted to which engine will finish first for the season. Most bets are undoubtedly on Stockfish to win for the third consecutive time. 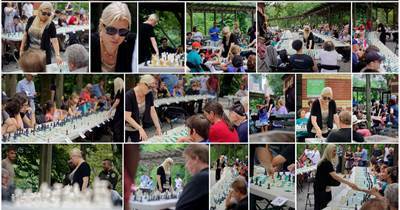 Here's Susan Polgar doing what she does best -- promoting chess. Photo top left: SusanPolgarCP11 © Flickr user 4paul! under Creative Commons. Learn techniques from world-renowned chess experts. Then put your new skills to the test against a grandmaster while they challenge 30 participants – simultaneously! This program is FREE. Space is limited. Participation is first come, first served. No groups, please. Ages 6+, prior experience required. When I click on one of my links in the top half, the next page reverts to HTTP, but I can activate HTTPS by simply changing the URL. Subsequent pages retain HTTPS unless they are loaded from a different directory. My domain host tells me I need to 'Create a 301 Redirect to Enforce your SSL certificate'. I followed the instructions to implement this (HINT: .htaccess) and almost everything looked good. I had one issue with image files, so I decided to test using an image in a blog post. 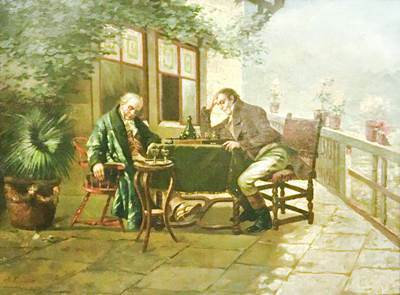 A. Kindler (1833-76) German  Framed 1874 Oil Canvas Painting, 'Men Playing Chess'  Dimensions of Canvas: 28" x 22"
Now let's see if it works correctly. Investigate why the security certificate (issued by Let's Encrypt 'Free SSL/TLS Certificates') is only valid for three months, to 15 October 2018. Examine the impact on the site's stat logs. Flag the HTTPS change to Google search. I suspect that last part will be done automagically, but I would like to be sure. It's been a couple of weeks since I noted the passing of the only surviving founder of Chessgames.com, Daniel Freeman (1967-2018), and since that post I've taken the time to explore the site in more depth than I usually do. Archive.org claims to have 'saved' the Chessgames.com home page more than 2000 times. Its first copy of the home page looks like the following. The chess games of Robert James Fischer [archive]  Dec-24-01 Sneaky: The greatest chess player of all time! The chess games of Garry Kasparov [archive]  Sep-22-02 Tigranvp: I viewed the series of tapes about Gari, and they are of poor quality, though the analysis by Kasparov is outstanding. Who ever that was that interviewed Kasparov (Plaskett?) He sure looked silly trying to show up GK. The chess games of Magnus Carlsen [archive]  Jul-30-03 MoonlitKnight: This Norwegian child prodigy has reached 12 years and will soon be receiving his IM title. He's being trained by Norwegian GM Simen Agdestein, himself once the youngest grandmaster in the world. Carlsen (2385) will never achieve that accomplishment, but nevertheless, he's a kid to look out for. That first item, by Sneaky, is particularly revealing because 'Sneaky' was an alternate username, a pseudonym, used by Freeman himself. In December 2001, he was undoubtedly testing the functionality by seeding the site with comments to provoke reactions from other users. Here's another example of a first forum comment, perhaps to seed a theretofore overlooked page from an important player of the past. Putting all of this together, we can calculate that Chessgames.com will soon celebrate its 17th anniversary. How long can we expect it to survive? Based on recent forum comments by its numerous devotees, the future of the site is not at all certain. Freeman apparently coded and administered the core functionality of the site by himself, never spending any time on succession planning. The site is well regarded by other key players in online chess. From Chess.com's CEO Erik Allebest, who knows a thing or two about building a world class web site: Thank You For ChessGames.com, Daniel Freeman (1967-2018). As one of the first major chess websites on the internet, ChessGames.com made quite an impact on me. As I was diving deeper into the game as an hobbyist in the early 2000s, I spent a lot of time learning and reading on ChessGames.com. I pored over famous games and players. ChessGames.com has always captured the depth and richness of the game in a pure and traditional way. In stark contrast to this, many world class chess historians have been antagonistic to Chessgames.com since its creation. I documented one particularly vicious attack in Chess History Cat Fight (December 2013), and I could cite more examples. If chess grandmasters treated amateur players the way acknowledged chess historians treat amateur historians, no one would support the GMs. I suspect that nearly all published chess historians work mainly on their own and don't understand the nature of community, crowdsourced work. How many of them contribute to Wikipedia? Daniel Freeman understood community work and he built a chess site that proved it. If the site eventually collapses because he is no longer behind it, I doubt that anyone else will be able to improve on his vision. Interested in a free copy of American Chess Magazine (ACM)? Here it is, but you'll need to be a fast reader. Why is this excellent magazine so overpriced? I mean it may be classy, but so is NIC [New in Chess] magazine and they are affordable. Would love to buy ACM more than once so it's a pity. Both are worthy of a follow-up post. Now I can cross that first follow-up off the list.  P.S. 'All Four Issues' would appear to be Nos.3-6, 2017 'Summer' edition through 2018 'Spring'. For info about subscribing, see acmchess.com. More than 125 000 unique viewers followed the dramatic victory of Leela Chess Zero (aka Lczero or Lc0) in [Season 13] Div 4 of the Top Chess Engine Championship. After four round robins, Leela came on top of the division with 20.0/28 with 14 wins, 12 draws, and 2 losses. This was 1.5 points more than the second neural net in the event Deus X powered by Lc0, and 2 points more than the top traditional engine of the division Wasp. As impressive as the results were, the hype surrounding the event was even more impressive. The Chessdom report continued, 'These results confirmed the dominance of the neural nets, modeled after Google subsidiary DeepMind’s Alpha Zero chess neural network.' Did everyone forget that the 'dominance of the neural nets' was in the lowest division, the first qualifying event, of the TCEC season? Since when are gold medals given in the preliminaries of any competition? If we have similar medals for divisions three, two, and one, what will they give to the overall winner of the season, a blue ribbon? 2018-08-07: Statement From LCZero Core Dev Team; [Albert Silver] needed incomparably less effort relative to the effort that he reused from the LCZero project [...; He] decided to hide information both from the LCZero community (by asking TCEC administration to be secret until the very last moment), and from TCEC administration (by not sharing appropriate information about importance of the engine vs neural network weights). The team welcomes open and fair usage of the engine and tools around it, but in this case it was certainly not fair. We strongly condemn Albert’s submission which may be seen as plagiarism, and poor behavior. Although the last of the four was my favorite, I already featured it last year in How About a Game of 3D-Chess? (November 2017). Let's go with my second favorite. IM Danny Rensch summarizes the "top 5 moments" from the AlphaZero vs Stockfish chess match in a single video that shows the critical, most interesting moment and ideas from each game. The same description points to IM Rensch's 'Full Review' for each of the five games. HTTPS as a ranking signal  Is this the reason for the drop in the number of daily visitors on my site? [...] That promises more work that has nothing to do with the content of the site, but I need to look into it at some time in the months ahead. It turns out that the site already has HTTPS security (SSL) enabled. When I click on one of my links in the top half, the next page reverts to HTTP, but I can activate HTTPS by simply changing the URL. Subsequent pages retain HTTPS unless they are loaded from a different directory. My domain host tells me I need to 'Create a 301 Redirect to Enforce your SSL certificate'. I'll look at that in another post. A little more than a month after I posted about the 2018 CJA Award Entries, the Chess Journalists of America announced their award winners in Awards (chessjournalism.org). Before you click (or tap) that link, take a deep breath! The page is unusually clumsy. The top of the page still mentions, 'CJA Award Entries accepted until June 18th! ', as does every other page on the site. The awards themselves are listed in reverse order. They start with a couple of 'Special Achievement' awards and end with 'Chess Journalist of the Year'. Within different categories, any 'Honorable Mention' awards appear before 'First Place' awards. It's impossible to copy/paste from the list; instead you have to click a winner, view the CJA award certificate, and copy the relevant text from there. I could go on (no links to the original work) but what's the point? The CJA might not care enough about their awards to spend time on how they are presented, but other people -- the award winners? -- certainly do. The Journalist of the Year award went to Mike Klein. As far as I can tell, this is the third time he has won the most prestigious of the CJA Awards. I covered the two previous occasions in 2012's Best Chess Blog, Chess Journalist, Chess Art (August 2012) and 2015 CJA Awards (August 2015). To hear him talk about his craft, follow the links in USchess in Podcasts (June 2018). Here is a copy of his 2018 certificate. In the 'Top Book' category, Lev Alburt and Jon Crumiller won the award for 'Best Book - Instruction' for their 'World Chess Championship: Carlsen v. Karjakin'. Tim Harding won 'Best Book - Other' for 'British Chess Literature to 1914: A Handbook for Historians'. How does an Irish national writing on a British topic win an American award? Because publisher McFarland, who submitted the nomination, is located in North Carolina. My post on '2018 Award Entries' showed four of the five entries for 'Best Chess Art', plus a link to the fifth. The winner was Paul Dickinson for his two-page Chess Life (CL) cover. Of the two 'Honorable Mentions', one deserved it, one didn't. Pasting chess pieces into the background of an ordinary drawing is not a noteworthy example of chess art -- what is acceptable for a cover, can be bad for an award. For my favorite category, 'Best Chess Blog', the winner was not a blog, but a single blog post: Playing The Quintessential American Tournament: The 2017 World Open (chess.com) by Sam Copeland. Follow that link for another link to all of his blog posts. I would guess that Chess.com's 'Top Bloggers' is also a good source for other blogs and blog posts of merit. A 'Best Chess Blog' winner of yesteryear, John Hartmann (2015; see the link above), won 'Best Chess Column' for his CL 'Looks at Books'. I always end these CJA award posts with a hearty, heartfelt 'Congratulations to all winners!'. This year is no exception. If you're interested in the current and planned activities of the CJA, see 2018 Meeting Minutes, although where and when it was held is a minor mystery. 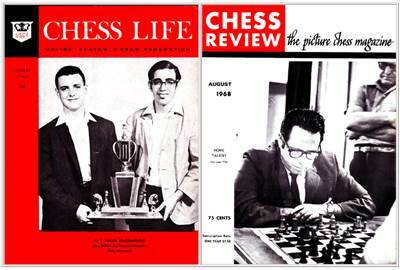 Fifty years ago, what did the two leading American chess magazines choose for their cover material? Just like last month's July 1968 'On the Cover', we'll use this blog's built-in time travel machine to examine CL's 'story next month'. Norman Weinstein, a seventeen-year-old student at M.I.T., and Gregory DeFotis, a sixteen-year-old high school student from Chicago, tied for first place in the third annual United States Junior Championship. Both players went through the tournament with undefeated 5-2 scores and were declared co-champions. The tournament, an eight-player invitational round robin held under the auspices of the U. S. Chess Federation in cooperation with the Piatigorsky Foundation, was played July 15-22 in New York City. For the 1967 U.S.Junior Champion, see September 1967 'On the Cover'. Bisguier was first listed as 'Managing Editor' in March 1967. Before that he was one of several 'Contributing Editors'. For his previous cover appearance in this blog's monthly series, see the CR side of November 1966 'On the Cover'. The only relevant info I found was in the LCZero forum: What the heck is DeusX?. That question went unanswered, except for speculation about 'the internet majors' (like Google) and Shay Bushinsky (of Deep Junior fame). While I was working on that post, the answer appeared elsewhere: Deus X – the Neural Network by Albert Silver powered by Leela Chess Zero (chessdom.com). Here's an embedded version of the video introduced on that page. Deus X, the chess engine by Albert Silver, is a new neural network that will be debuting this season in TCEC. Here is an interview with the author presenting his Neural Network. The event, a quadruple round robin, can be followed on TCEC - Live Mode and is currently in the third stage. LCZero, Wasp, and DeusX are placed 1-2-3, within 1.5 points of each other. The rest of the field is 3.5 points behind DeusX. I'll have a longer report for my next post in the series. If I have another month of auctions like these I might have to stop the eBay series. Where does one go these days for better quality auctions? This month my short list had only one item, but it was not short on quality. Pictured below, it was titled 'Charles Schreiber, (1845-1903, French), "A Game of Chess", Oil on [canvas] Lot 160'; subtitled 'Part of a live auction event on Tuesday, Jul 17'; and sold for US $3250 after 20 bids. Condition Report  Visual: Generally good condition. Craquelure scattered throughout. A small spot of paint loss lower right. ; Blacklight: Touch-up scattered throughout, including a 2" scattered line in the center and a .5" x 1.5" area lower left; Frame: 29" H x 32" W x 3.5" D.
I found another, similar painting by the artist, titled 'The Next Move'. For other works, see Charles Baptiste Schreiber (artnet.com). 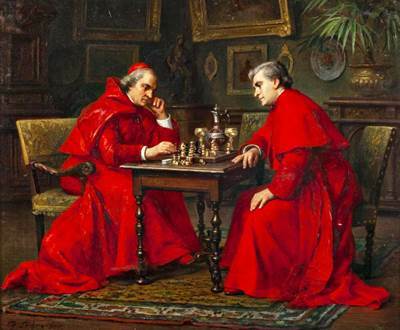 For some reason that escapes me, chess playing clerics were once a popular subject; see also Chess with a Cardinal (July 2015) on this blog.